This is a unique historical journey that will offer readers a glimpse of our country’s past as it was: renowned Group of Seven painter Lawren Harris boldly brings to us, by way of poetry and painting, a snapshot of early urbanization. In 1922, as the Group of Seven was emerging as a national phenomenon, Lawren Harris published his only book of poems — Contrasts — the first modernist exploration of Canadian urban space in verse. Harris also wandered the streets of Toronto, sketching, and creating a powerful set of urban paintings. Lawren Harris: In the Ward brings his poetry and painting together for the first time. The book, including previously unpublished poems, offers a new view of Harris’ pre-Group of Seven career, while presenting an exciting window into Canadian urban space at the turn of the century. 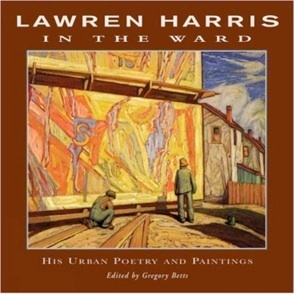 “Related to the above is my candidate for the 2007 art book that should not be overlooked simply because it’s a trifle obscure, Lawren Harris in the Ward: His Urban Poetry and Paintings edited by Gregory Betts (Exile Editions, $24.95 paper). Harris’s poems are simple and sometimes amateurish descriptions of small urban scenes, but these little-known paintings are quite remarkable. When he was not busy being a member of the Group in both the actual and the imagined North, he painted many Toronto street scenes involving domestic architecture. These ones concern the Ward, a vast immigrant slum that occupied approximately what is now the downtown from Bay to Yonge and ran as far north as College Street perhaps. You often see some of these pictures reproduced in surveys of Canadian art. The ones here, however, are the missing link of Lawren Harris, representing the magic moment when the recorder of observable fact became the mystic and visionary Harris who was so conspicuous later on. There’s real polychromatic beauty in these deceptively straightforward and vibrantly coloured paintings. No trace of German Expressionism in Harris’s enchanted city. There is something ethereal, otherworldly, awe-stuck and yes spiritual, for example, in his portrait of the T. Eaton & Co. Manufacturing Building surrounded by the houses of the poor, as though to say that a city of gold coexisted with the brown streets of the common people, a kind of New Jerusalem rising from the maze of fire escapes and chimney-pots. No, really. Please take a look.” George Fetherling, George. Seven Oaks Magazine. “Lawren Harris lived from 1885 to 1970. To place these poems in context, they are contemporary with the works of Duncan Campbell Scott, E.J. Pratt, and the last poems of Charles G.D. Roberts, and they sound the most modern of the lot.